What you do as a graphic designer is you are communicating with people in a language that they don't know they speak. In my belief that a large acquaintance with particulars often makes us wiser than the possession of abstract formulas, however deep, I have loaded the lectures with concrete examples, and I have chosen these among the extremer expressions of the religious temperament. I've been thoroughly enjoying the documentary film How Much Does Your Building Weigh, Mr. Foster? about architect Norman Foster. There's a great passage in the beginning about the Hearst Tower (2007). As Foster himself outlined the challenge: "it's a very, very small tower amongst the most extraordinary collection of mega-towers. And how do you make this tower have a presence when it's physically so small?" Scale – in a way – is not the same thing as size. Scale is a quantity of somewhat abstract proportions. It bears a relationship at one level to the body. But it bears a bigger relationship to the imagination. The way, if you like, the pyramids in Egypt do. They remain – whatever you do: you walk up them, you walk round them – they remain the scale they are. Which is somehow bigger than what they really are. I love that insight: that the successful artist is not having a conversation only with the objective circumstances of the world; but rather, more meaningfully, with the imaginations of their audience. Critic Paul Goldberger has called Foster "the Mozart of modernism"; and in the film's view of him – particularly in his restlessness with conventional decisions – he reminds of Steve Jobs: the inversion of the relationship between the decisions made for functional reasons and those for aesthetic; or, rather, the understanding that the functional is incomplete without the aesthetic. The film does an good job of outlining Foster's particular sensibility: his striving for space; his sense of drama; his interest in sustainability; his global perspective; the relationship between the scale of his buildings, the world around them, and our own presence. "I believe that the infrastructure of spaces, connections, the public domain – the kind of urban glue that binds the buildings together – is more important than any one building." Well worth seeing. A complete departure and absolutely nothing to do with Portishead, I promise; or even, particularly, books or music. I was going to call this post "how to get a job" but in truth it's more like "how to apply for a job," or, at best, "how to get an interview." Last year I posted several job positions in Random House of Canada's digital team; for one of them I received – over a 10-day period – over 80 applications. Only two of those, as far as I could tell, were automated responses; the rest all showed some signs of someone having read the job description, assembled a resume and cover letter, and made a decision to send them. In other words, they went to the trouble. But not all of them went to very much trouble, and not all of them put thought into reducing my trouble. Since I just posted another position and found that I was steeling myself for the same experience, I thought I'd post my ideas on what a well-assembled job application should look like. So here are my pushy and opinionated tips for your application package. YMMV, obviously. Your cover letter and resume are not there to get you the job. You have to do that on your own. You have to do it in conversation (more on that later). Your cover letter and resume are to get you into an interview – and perhaps somewhat to define the terms of that interview. When you're preparing your materials, and trying to reduce their length, ask yourself this question: will this piece of information get me an interview for this particular job? Yes, you might need to include that period of minimum wage work in a completely different industry to explain a resume gap (we all have them, nowadays), but you don't need four bullet points underneath to explain exactly what you did. Company, title, dates. Move on. For jobs or education or anything else with specific applicability to the job for which you are applying, no more than 3-4 bullet points to summarize the responsibilities of your role and highlight some specific achievements. Everybody gets so many applications for a job that sifting through them very quickly turns – despite anyone's best intentions – into "give me a reason to reject this application." We'll look for anything: spelling errors, grammatical mistakes, or just being bored (this is especially true in content industries; if you're applying for a writing/marketing job, you absolutely don't want to seem boring). The longer your letter/resume goes on, the higher the chance you'll make a mistake. Here's how you want it to go down: "this looks professional; he/she has pertinent experience; I've reached the end." There's no alternative action left to the hiring manager other than to set up an interview. Your cover letter – properly laid out like a letter with addresses and everything else in the right place – should not exceed a single page. Your resume should ideally not exceed one page; I personally dream of receiving one-page resumes but will settle for two. No more. This is your 'master resume'. 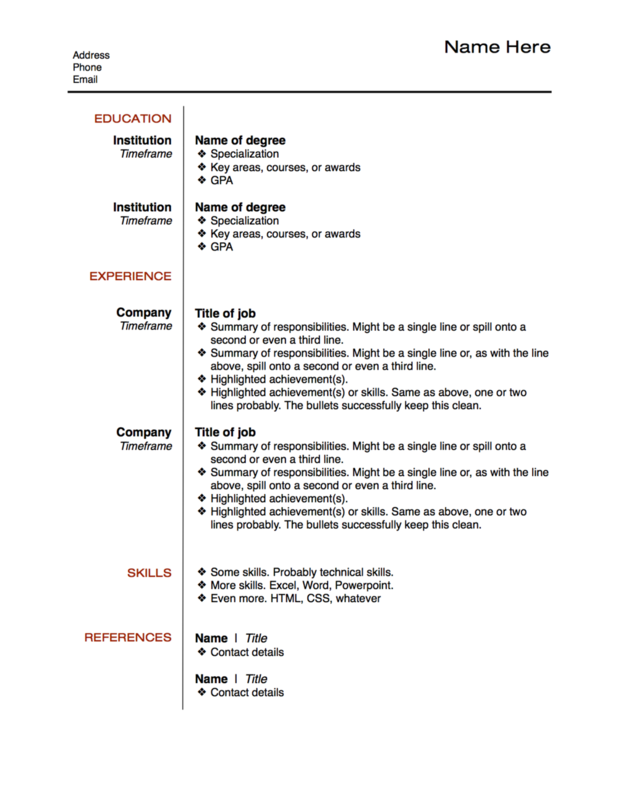 When you are applying for a specific job, you take this master resume and selectively remove non-applicable pieces. Now, you can't cheat: if only one aspect of your last job was applicable, but it was only 5% of your responsibilities, you can't remove everything else and give the impression that it was 100% of your responsibilities. And you may have to reword things slightly. But the point is that you are not re-writing your resume every time you apply to a job. You are editing it down to size. That size is 1-2 pages. Seriously. What is it that excites you about this role? Say it. This is what your cover letter is for. Is the job in an industry that is undergoing exciting change? If so: what is it, and why is it exciting? Is the job at an industry-leading company, or an underground boutique startup, or working with a particularly impressive team? Say so and explain why that appeals to you. By doing so, you demonstrate that you are thoughtful about the opportunity and your career, that you have the committment to do some research, and you allow your prospective employer to imagine how you might contribute to the team or the company. If your cover letter is all about you, and not at all about the position or the company or the industry, it's harder for a prospective manager to see how you might fit into the role. We've all seen the resumes that open with 'Objective', 'Highlights', or 'Profile'. Please don't do that. Really. It's my #1 pet hate. I never, ever read it. Why? Because that isn't what I'm looking for in your resume. That's in your cover letter, where it exists in two or three sentences and doesn't convey the same bland set of meaningless qualities that everyone else touts. Maybe you are an "independent self-starter" or an "effective multitasker," but I'm afraid that these claims are going to be completely ignored because of their use by people who are emphatically not any of those things, usually don't realize it, but nonetheless claimed so at the top of their resume. If you genuinely do possess these qualities, I'm going to be able to infer them from the quickly summarized specific achievements in specific roles on your resume. If you led a set of specific process improvement initiatives with specific results in your last job, I'm going to know that you are an independent self-starter capable of working within and across teams with a results-orientated approach. Show, don't tell. When I open a resume, I'm fairly quickly looking to get a sense of what you have done, not who you are. Your attitude, intelligence, and approach should all have come across (briefly!) in the cover letter. When I get to the resume, I really, really don't want to come across a trailer. Especially a boring one. If you insist upon a summary at the top of your resume, then summarize in a visually coherent manner your experience. Solve the resume problem that, as its reader, I face: trying to figure out what the hell all this stuff is, when you did it, for how long, and how has led us to the current situation. How should this information be best laid out in order to clearly and quickly communicate it? What can I do to ensure that my resume stands out from everyone else's resume? Why not? Remember #2: I'm likely looking for the first possible excuse to put your resume down and move onto the next one. A really really good excuse would be that in order to understand your resume I needed to reorient my entire understanding of visual hierarchy or design conventions. Your task here is to make me think less, not more. You want your resume to look like a job application, not a Futurist manifesto. Try not to use glaring colour schemes, background images, etc. Your resume should be no more than three colours. Two of those colours should be (1) black and (2) white. Clue: the pages should be white. A third colour may be used discreetly for accents (e.g. headings, dividing lines, etc). See how clear that is? If you are a design professional and you are applying for a design job, by all means spend a great deal of time thinking about the design of your resume. If you are not, avoid anything that might risk abominable personal branding exercises, clip art, and idiosyncratic attempts to reinvent our collective perception of time. Oh, and that reminds me: I rather like the single-document pdf attachment. So you're including one file with your email (your email, by the way, should be a single sentence, something like "please find attached materials to support my application for the role of Web Analytics Specialist at Steamworks Analytics"). This attachment is a pdf; the first page is your cover letter (properly laid out) and the second (and maybe third) pages are your resume. This single document is wonderful because I can print it easily and quickly for myself or anyone else; pdf has the additional advantage of preserving your resume's coherent (see #7) layout and means it will display consistently on my laptop, phone, or wherever else I'm trying to open it. It the job posting asks you to include links that showcase your work, include links that showcase your work. Your best work. Ideally recently. If you don't have recent pertinent work: should you really be applying for this job? If it's a job that involves writing copy, you should probably be able to demonstrate that you can write copy, even if your current gig isn't writing copy. When I say we end up looking for any reason to reject an application – see #2, above – this includes an email address like ilikemesomehoneyandfireworks@gmail.com or gina@iamasexyginbunny.com. Please.